The popularity of American style barbeque has grown at lightning speed across Australia with restaurants, food-trucks, bars and competitions increasing in number at a rapid pace. From a small competition during the Melbourne Food & Wine Festival in 2013 to the more than 15 different competitions taking place throughout 2016, Australians have most definitely embraced this low and slow style of barbecuing. Fitting well with the relaxed lifestyle in Australia, this approach to barbecuing combines good food with the opportunity to catch up with family and friends. An early morning start is required to fire up the coals in preparation for the arrival of hungry guests in the afternoon. The first course is usually chicken wings or drumsticks while waiting for the brisket and ribs to cook. American style barbeque cooks at low temperatures over several hours to produce exceptionally tender meat, of melt-in-the-mouth texture, served with a barbeque sauce that is usually prepared from a highly guarded recipe. Such is the devotion to barbeque in the U.S. there are several long-standing competitions across the country each year. Here in Australia there are a growing number of annual competitions for contestants to pit their recipes against competitors from across the country. Early April saw the next in the Australasian Barbecue Alliance competition series. The Vic’s Meats 2016 Australian Barbecue competition took place in Port Macquarie with 84 teams competing in Round 6 of the Australian Barbecue Championships. Creativity was on display and not just on the grill with team names including Limp Brisket, The Inglorious Basters, Kiss My Brisket, May the Sauce Be With You and PETA (Pitmasters Easting Tasty Animals) to name but a few. 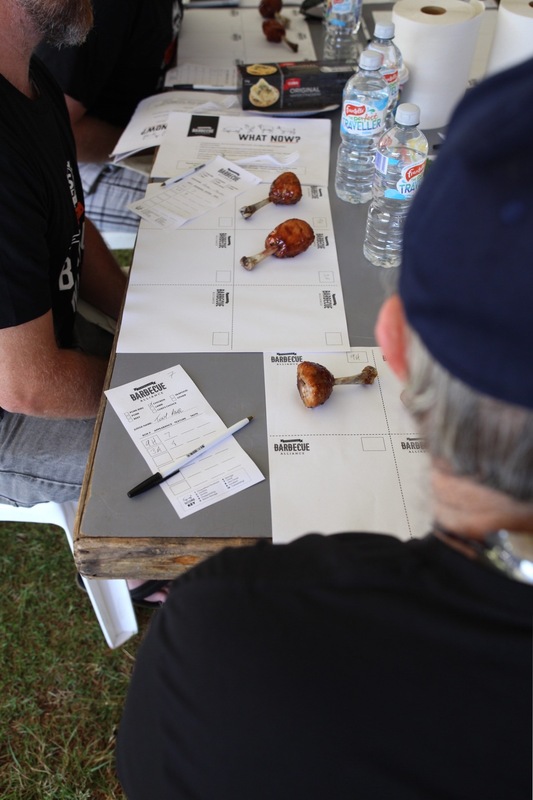 Inside the Judges Tent – first turn-in of the day, chicken. Credit: Australasian Barbecue Alliance. Meat inspection took place on Friday afternoon, after which the teams were left to prepare their dishes and nurse their smokers through the night. Temperatures soared on Saturday making it hot work for the competitors as they prepared for the first turn in at 9.15am. Chicken kicked off the turn-ins, followed in quick succession by pork, lamb, beef and pork ribs before concluding with Chef’s Choice – an opportunity to freestyle it and showcase each team’s creativity. Several teams travelled from across Australia with Tasmania winning this year’s Chef’s Choice. The cherry wood smoked cheesecake with smoked pecans and salted caramel sauce from Hobart’s Fluke & Bruce, provided the perfect counterpoint to the previous five courses of meat for the judges. Winners and Grand Champions were Double Barrel BBQ from Brisbane who put in a solid performance placing in the top five for four of the five meat categories and in the top five for Chef’s Choice. Grand Champions Double Barrel BBQ with Australian Barbecue Association Co-Founder Jay Beaumont (second from the right). Team members L-R; Alex Bennet, Adrian Blomfield (Team Captain), Neil Dransfield. Credit: Australasian Barbecue Alliance. 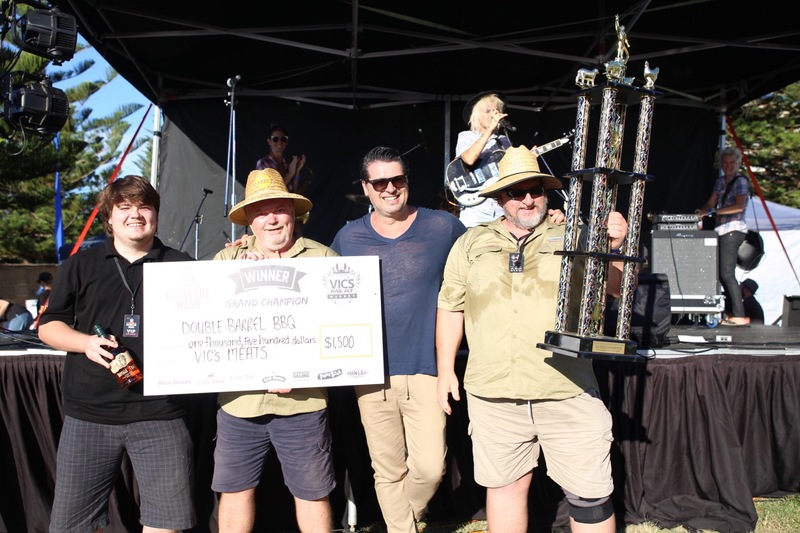 Relatively new to competitive barbeque, Double Barrel BBQ placed in the top 10 at last year’s Port Macquarie competition – their first competition. Since then they have competed in the Brisbane, Burleigh and Bungalow competitions as well as collecting the top spot as Grand Champions at the competition in Orange this year. I asked the Team Captain Adrian Blomfield what changes the team made between their debut in Port Macquaire and the competition this year: “Preparation for this year’s competition just involved lots and lots of practice. Each time we compete we evaluate the finished categories and document the issues. These are then attended to in the next cook.” The addition of a new vertical water smoker also helped lift their game, allowing them to use pecan and apple wood for flavour. In addition to cooking time, the other main difference between American and Australian barbecuing is the importance of sauce and rubs in American barbeque. Each team works to create their signature flavour with sauces and rubs, which are typically a mixture of secret recipes created after hours of testing and practise and those that can be bought, or in the case of Australian competitors, imported from the U.S. Double Barrel BBQ produce nearly all of their sauces from scratch and approximately half of the rubs used for each competition – a clue perhaps to their expeditious rise to the top.